Although Robert Hedlund of Garfield creates beautiful works of art, they are also functional: It's up to his customers as to how they will use the fish decoys he carves and whether they will display them on a shelf or use them to attract an aggressive northern pike. "Three-quarters of my sales are workers," he said, meaning decoys that are suspended on a line in the water for winter spearfishing. "One-fourth of them go to the shelf for collections." Regardless of how they are used, Hedlund makes them "swim" realistically so they can be used as actual decoys if the buyer so wishes. 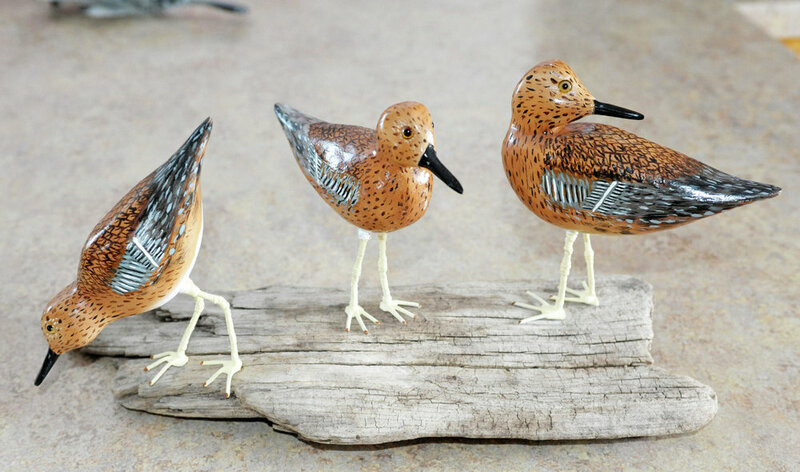 It takes many hours to carve, detail and paint the decoys. The key to making them look realistic to another fish is not so much in the cosmetic details, but in the balance and use of lead for weight. "The more active the decoy, the more chance of a northern coming in," he said. In order to test them and make adjustments to the balance, he has a tank in his shop. "You want it to sink slowly and with forward momentum," he explained. "You've got to swim them. You've got to balance them." However, he also encourages prospective buyers to try out the decoys in a swim tank, which most decoy shows have. "I want them to know what they're getting," he added. His work will be displayed at the annual Rudy Zwieg Decoy and Sportsman Show at the Runestone Community Center in Alexandria this Saturday, March 16. The show runs from 9 a.m. to 4 p.m. and admission is free. Hedlund, who has been carving decoys for the past 10 years, has been named this year's Carver of the Year by the Mid-State Chapter of the Minnesota Darkhouse and Angling Association. A lifelong angler and spearer, he also serves as president of the Mid-State Chapter.